1. Keep your children close. At the end of the last section, we noticed an important principle that must be used as an introduction to the remaining material - Our physical survival is only important because it is a tool to bring others into spiritual security. The final two steps from our list will emphasize the practicality of our existence while we are still here. For decades we have watched as the line of morality has been pushed farther and farther away from its anchor point (the biblical principles upon which this county was undeniably established). It is way past time for Christians to make a stand. Teach your family the absolute, unchanging principles of God. Speak out when your friends trivialize cultural chaos. Vote God's values! The ONLY solution to this cultural crisis is for the Christian community to return to the teachings of absolute biblical authority. We must also initiate a new generational momentum that will be committed to carrying on that priority. Rarely, if ever in human history, has a culture been blessed with the level of self-government that American's now possess. One might even say our nation has been Divinely favored. But with the great power of self-government also comes the great responsibility to be self-controlled. To maintain the Divine blessing of democracy, the example of God's people is essential. We set the bar. Because we anchor ourselves to the North Star, we also stabilize the culture around us. We are the salt of the earth. We must stand up! An old Middle East proverb tells of a cold winter's night and a camel that kept begging to get into the tent. First it was just his head. Then it was his neck followed by his shoulders. On and on the camel kept begging until his entire body was in the tent and the master was forced to sleep outside. Compromise is the greatest enemy of conviction. We cannot shack up with the devil and expect God to pay the rent. Read Romans 1:32. "Wait!" shouted the bear. "Let's talk about this. Can't we compromise?" "Compromise?" asked the hunter. "Why should we compromise?" The curious man inched closer to the bear. "Listen," said the grizzly bear. "You want a fur coat, and I want a full stomach. To compromise, all we have to do is..."
Suddenly, the bear jumped on the man! He wrestled him to the ground and ate him up. As the grizzly walked away, he licked his lips and exclaimed, "Ahh, compromise! I love compromise! Now I've got a full stomach and he's got a fur coat!" For decades, the American culture has been distracted by the fur coat. We have been inching closer and closer to the hungry bear and now the beast is upon us. Wasn't it the LGBT community that forcefully argued their lifestyle was a private matter? Wasn't it the LGBT community that assured us their private sexual choices would not put our children at risk? Yet here we are! 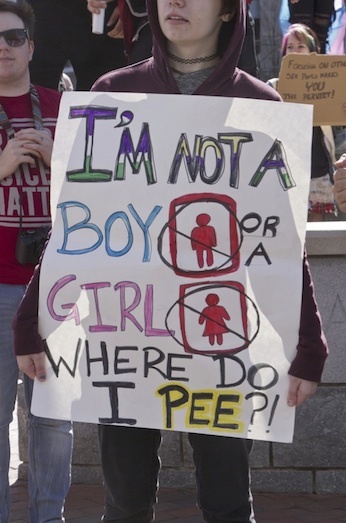 Less than a year after the Supreme Court decided to play God, our children aren't even safe in the bathroom. The camel is in the tent. The bear is threatening your family. Will you act? Will you keep your children close? Will you beg God to bless your home? Will you prepare for persecution? Will you resolve to act or will the sleepy state of carnal complacency drown out the alarm bells? The choice is yours. What will you do RIGHT NOW?! 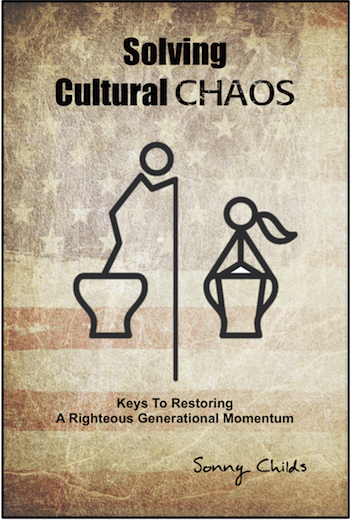 Solving Cultural Chaos: "Part 3"
Back to Top of "Solving Cultural Chaos, Part 2d"